Your application is deployed to multiple geographic regions (or multiple Data Centers) to provide for your end-customer's performance (think latency) or legal requirements (like data sovereignty). You can use Environments to represent each region or data center. 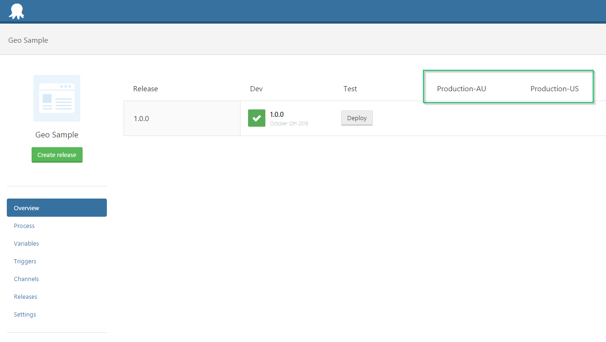 In the example below we have defined a Dev and Test Environment as per normal, and then configured two "production" Environments, one for each region we want to deploy into. Use Lifecycles to define a strict process for promotion of releases between your regions. Lifecycles can be used to design both simple and complex promotion processes. For example, you may want to test releases in Australia before rolling them out to the USA, and then to Europe. In another example, you may want to test releases in Australia before rolling them out simultaneously to all other regions. Scope region-specific variables to the region-specific Environments. Quickly see which releases are deployed to which regions on the main dashboard. Quickly promote releases through your regions using the Project Overview. Use Scheduled Deployments to plan deployments for times of low usage. This is a really good solution if you want to enforce a particular order of deployments through your regions. In Octopus 3.4 we introduced Cloud Regions which enable you to configure Rolling deployments across your regions or data centers. In this case you can scope variables to the Cloud Regions and deploy to all regions at once, but you cannot control the order in which the rolling deployment executes. Scope region-specific variables to the Cloud Region targets. Conveniently deploy to all regions at the same time. 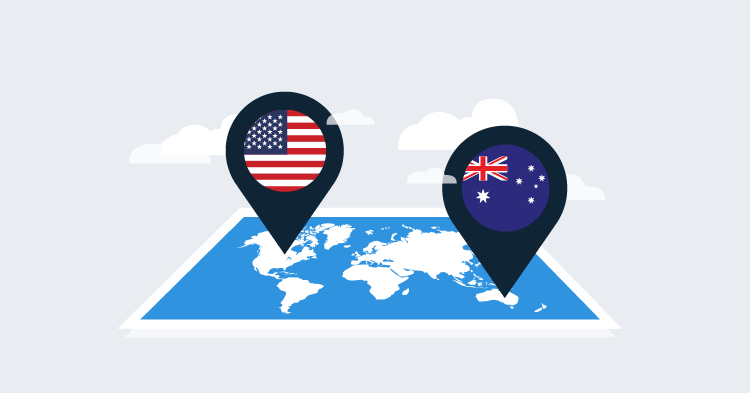 If you don't really mind which order you regions are deployed, or you always upgrade all regions at the same time, Cloud Regions are probably the right fit for you. You do give up the advantage of enforcing the order in which you deploy your application to your regions, but you gain the flexibility to promote to your regions in different order depending on the circumstances. Tenants offer a balanced approach to modeling multi-region deployments, offering a measure of control and flexibility. Environments, Tenants and Cloud Regions can be used to model multi-region deployments in Octopus, but each different choice is optimized to a particular style of situation. Choose the one that suits your needs best!